I tried it many years ago, but I read somewhere that you can use grapes to capture yeasts instead of from the air. You make the mix as stated above but just submerge a couple of grapes into it. At the time I stupidly used store-bought grapes when I should have used the Concords that grow around here. It worked and I used the starter a few times, but then moved across the country a short time afterwards and abandoned it. I might have to give it another try. 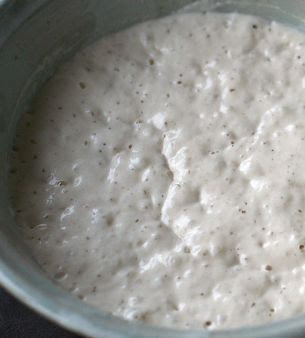 There's also Carl Griffith's sourdough starter that you can get for free. Just google his name and you'll find the website that his family runs. Her whole blog is shot through with reality checks that cut through the sometimes mystical world of bread baking. I think I'm in love with her. I have made bread before and it amazing the functionality of the yeast. It is no easy task being a baker i assure you of that. I never tried to culture my own yeast but if I ever have anytime in my busy schedule, I might just try the concord grape method. Your bread does look delicious with butter and a hot cup of coffee. Yum! I have a schedule that would kill a lesser man and if I can find the time to do this, anybody can. I'm convinced that scratch-baking bread lends itself to modern life because the time it requires comes in short bursts spread out over a couple of days. I swear though, if I could make a living from it, baking bread would be all I did. It's a pleasure to meet another baker! Oh, and my bread goes best with coarse salt and olive oil. Bread with salt and olive oil has made me forget that butter even exists when it comes to bread spreads. I feel the same way about cheesecake. Unfortunately nobody here at the DogWalk likes cheesecake, so disposing of the evidence gets to be a bit of an issue. I usually have a slice, maybe two and that's all I can afford to eat. My latest creation was a caramelized banana, almost like a Bananas Foster. I need to make a few more to get the right balance of caramel and banana, but I'm willing to make that sacrifice. Making things by hand from scratch slows my brian down a bit and makes me realize that this "24/7/365-gotta-have-it-yesterday" world is a very artificial one. And if you are the best bread-maker in town, folks will give you the time you need to make it right. Ahhh, cheesecakes are another thing that lend themselves to wild experimentation. There's just something fundamentally appealing to anything that comes out of an oven. I bake bread for the very reason you bake cheesecake. I like running into something that can't be rushed and I love that bread is resolutely impulse-proof. I learned how to bake while I was in the Army and did bake bread a few times after I got out. The best was one Thanksgiving when we we served at 2:00, then went into the kitchen about 7:00, sliced some of that bread and made sandwiches! Since then, though, I always end up making homemade biscuits, and even those just once in a while. The highlight of my Thanksgiving every year is when I bake the bread my stuffing's made from. Nothing can compare with handmade and homemade.